Shining Crown slot is most definitely another addition to the low-tech series of slots from our Bulgarian friends at EGT. Unlike the 40 Super Hot and 100 Super Hot editions though you actually get a bit of action here although you still don't get a feature and this came as a surprise when I discovered that there are actually 2 different scatters on the game! 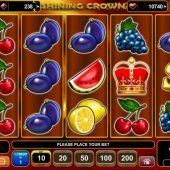 The format is the typical stacked fruits mechanism with the usual EGT sounds as the reels spin and stop and pretty basic graphics and animations. So can these Crowns add a shine to your balance? You have a standard 5 reels and 3 rows over which there are 10 pay lines. The icons all appear stacked except the scatters and Crowns with pays befitting the low number of lines. You must pay a fixed 10 coins per game and the game only pays left-to-right unlike some slots with this format such as Novomatic's Power Stars. Only the lower icons appear fully stacked 3 rows high, and these are the Plums, Oranges, Lemons and Cherries awarding 15x bet for a full 5-of-a-kind win. The Bells can appear 2 rows high and award 20x with the remaining standard symbols appearing singly, Grapes or Melons paying 70x bet and if you are lucky enough to see the Red 7's, a colossal 500x bet for the full line! The two different scatters I mentioned are a Pink Star on reels 1, 3 and 5 which simply award a fixed 20x bet should they all appear and the Gold $ scatters appear on all reels paying 5, 20 or 100x stake for 3, 4 or 5 respectively. So we leave the best until last and unsurprisingly these are the Crowns around which the game is centred. They can only appear on the centre 3 reels and will expand to form a full Wild when this can create a winning combination. It is thus possible to land a Red 7 for example on the centre row of the outside reels and get 3 expanding Crowns to award 3 lines of 500x bet together. The Red 7's can also pay 2-of-a-kind.